Led by Fabu and fellow authors Catrina Sparkman and Sherry Lucille, an upcoming event at the Middleton Public Library called “Hidden Voices” will bring three vital 20th century literary figures - Jean Toomer, Lorraine Hansberry, and Sarah Webster Fabio – into the spotlight. They hope to raise the voices of these writers from the past. They think in doing so, they can inspire readers to seek out the Midwest’s fresh new African American authors today, as well. Sparkman believes a good author can transcend barriers such as race and gender. Or bring them tumbling down. Today’s black writers are influenced by a broad spectrum of writers who came before them. Sparkman lists Toni Morrison, Ernest Hemingway and more on her personal list. But many of Wisconsin’s greatest black literary voices have gone largely unacknowledged by the general populace. Hidden Voices aims to change that. “Our culture, our history, our contributions to the world are largely unknown,” says Fabu. “So I learned as a child, that’s it was best to learn for myself.” Now she’s working to pass that knowledge on to others. Fabu, a well-traveled public speaker, author and scholar has spent time in Kenya (The University of Nairobi Press published one of her books), but she says Wisconsinites don’t need to travel that far to find important black voices. Wisconsin is rich with them. But they haven’t always gotten the credit they deserve. Fabu recalls standing in front of a wall dedicated to Wisconsin writers in a Milwaukee public library, and not seeing a single African American face. She remembers a list of influential writers compiled at the University of Wisconsin-Madison that likewise omitted diverse authors. As a youth, she was told that black populations began moving to Wisconsin, from Chicago, as late as the middle of the 20th century. Originally from Memphis, Fabu came to the University of Wisconsin – one of the few universities offering top level African and African American literary studies - for graduate school. She fell in love with the Midwest, and now calls Madison home. What she found when she came here was a world of black authors – poets, playwrights, novelists, essayists and more. Their voices were an integral part of the American literary canon, but for those outside of academia, they were not always widely known. 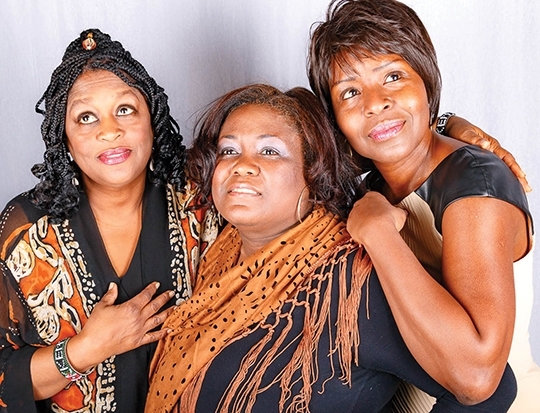 The three writers about whom Fabu, Lucille and Sparkman will talk on February 27 are just a few key examples. “It’s about celebrating these people,” she says. “It’s not about guilt. It’s not about beating anyone over the head. It’s about exploring and getting to know your neighbors. I think that’s a good thing. Lucille’s love of stories, particularly romantic ones, began early in life. Like every author, she learned through reading. Lucille tried to find other authors who delved artfully into the complexities of love. Much of what she found was disappointing. “I was reading a lot of love stories, and not really liking everything I read, and I thought I could do it,” she says. So she combined her faith and her ideas about love and created a voice all her own. In the stories of different people in different times and places, readers achieve a remarkable degree of empathy. Lucille points out she just started reading “In Other Rooms, Other Wonders,” by Daniyal Mueenuddin. Opening its pages is like diving into Pakistan, she says. In a digital age in which dialogue between differing people is increasingly rare, Lucille says events like “Hidden Voices” present an opportunity for real dialogue. It will be, she says, a safe place for all people to learn about three great writers, and to embrace tough questions in a productive way. The Hidden Voices event’s hosts are three modern authors who deserve attention. Each has developed a unique style and approach to writing. Fabu began journaling in grade school. At first, she wanted to be a novelist. But when she tried her hand at poetry in an attempt to break through a creative wall and into the world of literature, she fell in love. For Fabu, fiction, as a literary form, focuses on mechanics, whereas verse attempts to capture something that exists outside of grammatical constraints. In addition to working as a poet, Fabu has also worked as an essayist, written short stories, taught, and earned advanced degrees in African Languages and in Literature and African-American Studies. In poems, she finds both a sense of place and a sense of self. She reads the work of diverse writers. Some are famous. Some are obscure. “[Hidden Voices] has been my dream for a couple years now,” she continues. Lucille, who worked as a school counselor in Madison for nearly 30 years before retiring in 2016, now spins romantic narratives, largely about interracial love, in ways that balance passion and her Christian values. Like Fabu, she knows that inspiration is a key element to creative writing. Lucille calls Fabu “the genius behind” Hidden Voices. “I was actually introduced to Jean Toomer through her, but it was like a love match when it happened,” she states. Lucille says Toomer embraced the fluidity and complexity of race. She says he wanted to grapple with blackness, with whiteness, and beyond. “He said, ‘I am all these things and more,’” she says. Lucille, who points out she is “happily married to a black man,” believes there is something important to be found in the narratives she writes about interracial love, particularly taking place prior to the end of the 1960s. Sparkman will never forget the first time she saw black performers on stage. It was “Fences” by August Wilson, and Sparkman was only a child. Sparkman says she had already been “blessed with educators who saw something and helped cultivate it” in her writing. She remembers one such teacher, at a Catholic school in Milwaukee, who would always give her two grades on her papers, holding her to a higher standard in an attempt to inspire her to reach new heights. “He’s write, ‘For anyone else, this would be an A. For you, it’s a B-,’” she remembers fondly. She ended up writing for the stage, as well as teaching theater at the University of Wisconsin. Later in her career, she made the transition from playwright to novelist. She wanted, she says, to write for the page. Both kinds of writing require that authors hone their distinctive voices. Sparkman worked at first to hear the voices of other authors. Then she worked to find and perfect her own unique style. During her life, Lorraine Hansberry accomplished and wrote much. She is perhaps best known for her groundbreaking play, “Raisin in the Sun,” which debuted on Broadway in 1959. The title comes from the Langston Hughes poem, “Harlem” and the play was the first by a black woman to make it to Broadway. Hansberry’s creative powers fermented during a youth full of adversity. Her father was involved in the landmark Supreme Court case, Hansberry v. Lee, which challenged discriminatory housing practices. As a young girl, Lorraine Hansberry saw a brick hurled through the window of her family home, and she witnessed her mother patrolling the house at night with a shotgun to keep her family safe. When she grew up and became an author and playwright, Hansberry created characters who drew upon biblical struggles. Likewise, Sparkman turned to an Old Testament prophet when she began writing her current four-novel cycle about betrayal and forgiveness. “It’s a modern-day retelling of the Book of Hosea,” she says. In that story, the love of a man for his unfaithful wife is linked to the love of God for His unfaithful people. In it, Sparkman found fertile creative ground. “It’s about radical forgiveness and militant love,” she says. “Hidden Voices: African-American Writers in Wisconsin” will take place Tuesday, Feb. 27 at 6:30 p.m. in the Archer Room on the Library’s lower level. Advanced registration is appreciated.